Reference number for this case: 13-Oct-54-Nîmes. Thank you for including this reference number in any correspondence with me regarding this case. AVIGNON, October 15th. - Early in the afternoon of Friday, at 1:30 p.m., the population of Fontaine de Vaucluse was in turmoil. Indeed, a "white disc" was hovering slowly over the small city and one could clearly distinguish it with good binoculars. This white disc was surmounted by a spherical protrusion of the same color. The lower circular border intermittently bears two powerful lights, varying from white to purplish, passing through the red. The air base of Caritat (Vaucluse), alerted, immediately directed two jet planes which soon made their appearance, and after two turns on Fontaine de Vaucluse, took altitude and dove on the "disc". The radio on board the planes, which was in communication with the base, announced that the craft was in sight, that it was being hunted, but that it escaped because its speed was higher than theirs. From Vaucluse, one could see clearly the disc skyrocketing, pursued by the two jets. from Calais said he had seen, at 3:40 a.m., at the place called "Saint Pierre Halte", on the road to Saint-Omer a yellow and shiny craft land on the railway tracks. According to the baker, the curiously shaped object was two meters in height and four meters in diameter. NIMES. - Two people saw last night, as they were returning home, a few kilometers north of Nîmes, a greenish glow in a field. They approached and found the presence of a craft in all aspects identical to a rugby ball and seeming to rest on crutches. The strange device suddenly rose into the air, emitting a faint noise and gradually taking on an orange hue. These two authors and ufologists indicate that on October 13, 1954 in Nimes in the department of the Gard, Mr. Pitot, of Nîmes, saw "something abnormal" during the night in the street Edgar-Sheep, a street of the periphery of the city. This object which he could not "absolutely" identify, rose suddenly in the air and "disappeared without noise nor light." The source is indicated as "Le Provençal" for October 14, 1954. 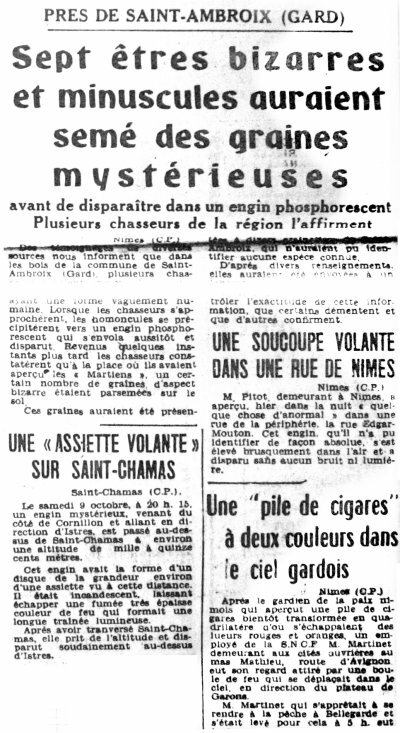 The Belgian ufologist indicates that on October 13, 1954 in France in Nimes, in the night, Mr. Pitot sees something abnormal in a street of the periphery of Nimes: the street Edgar-Mouton. This craft, which he cannot identify absolutely, rises sudenly in the air and disappears without any noise nor light. The source is indicated as: M. Figuet/ J.L. Ruchon: "Ovni, premier dossier complet..." - Alain Lefeuvre pub. 1979, p. 159. Luc Chastan indicates that in the Gard in Nimes on October 13, 1954 at an unknown hour a witness sees during the night, in a street of the periphery of the city (street Edgar-Mouton), "something abnormal". This object which he cannot identify absolutely, rises suddenly in the air and disappears without noise nor light. Luc Chastan indique que la source est "Ovni, Premier dossier complet... by Figuet M./ Ruchon J.L. ** Alain Lefeuvre pub. 1979". [rr1] Article in the regional newspaper Le Rouergue Républicain, France, October 16, 1954. [fr1] "OVNI, Premier Dossier Complet des Rencontres Rapprochées en France", book by Michel Figuet and Jean-Louis Ruchon, Alain Lefeuvre publisher, page 159, France, 1979. 0.1 Patrick Gross September 19, 2005 First published. 1.0 Patrick Gross December 29, 2008 Conversion from HTML to XHTML Strict. First formal version. Additions [go1], [lc1]. 1.2 Patrick Gross February 28, 2017 Addition [rr1]. This page was last updated on February 28, 2017.